Holyhead Hotspur continued their much improved form of late by knocking holders Flint Town United out of this season’s Huws Gray Alliance League Cup at the Silkmen’s own Cae y Castell in the first round. 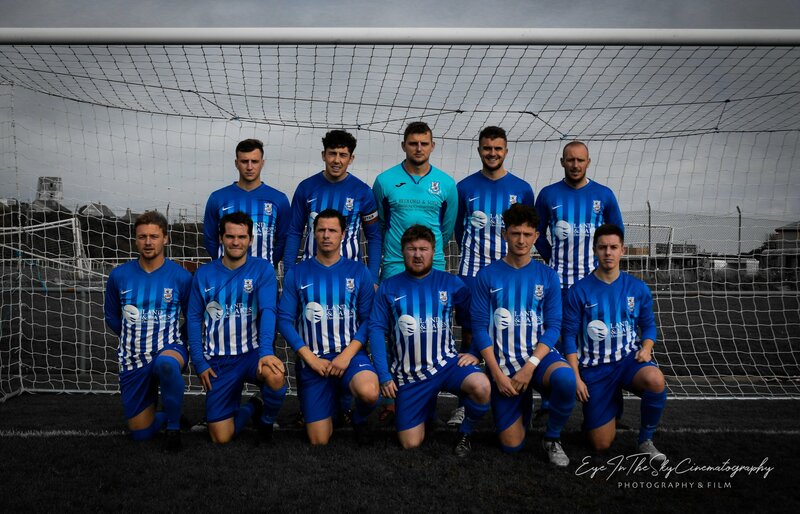 Much fancied Flint who won the trophy at the end of last season against Gresford Athletic can have few complaints as Darren Garmey’s men were full value for their success. The two first half goals from Jamie Mc Daid and captain Alex Jones seeing the Holy Islanders into the quarter finals on October 9th and a late reply by the hosts not enough to extra time which would have been rough justice on the battling Hotspur outfit. Resolute at the back, enterprising in midfield with Mc Dai and Luke Mc Givern working their socks off up front the ‘depleted’ visitors did their manager proud turning the form book and league positions upside down against a Flint side who ran in seven goals last weekend are amongst the early pacesetters. Thje delighted manager Garmey said after the game ‘ I was proud of the ways the players stuck at it throughout the whole game’ adding ‘we need to keep it going and take it to our next game a league fixture at longh distance Penrhyncoch this coming Saturday and the next home match against Porthmadog on Wednesday evening 26th September’ kick off 7.30pm. Hotspur started well but the hosts came close on 8 minutes when Rees Brown had to clear the ball from near his line and on 10 Carl Jones the away keeper missed his punch and the ball was thankfully cleared by a defender. Nip and tuck for the next 20 minutes but on 31 Harry Galleeotti make progress into the Flint box but was well tackled when about to shoot. However four minutes later on 35 Hotspur went ahead when Cory Jones threaded a fine ball through into Jamie Mc Daid’s path, and the striker in the Flint box and well placed delayed a few seconds and before cleverly seeing an opening drilled his shot into the far corner for a really wsell taken goal. Mc Daid’s game has been transformed with him leading the line in the past three matches . Two minutes later Mc Daid again wriggled through but this time shot over the bar. Flint with their slow build up where being shut down well by the Hotspur defence although they had much possession. In added time on the first half Hotspur added a second goal and eventually the deciding one when a corner from the left by Dean Garmey saw central defender and captain Alex Jones head the ball home between keeper Arfon Jones and the back upright for a two goal cushion lead at half time Half Time 0 – 2. Hotspur knew that they would be put under pressure in the second half and on 48 minutes former Hotspur striker Damien Ketley made a fine run finding Mark Cadwallader who shot a great chance over the bar for a bad miss. With Flint pushing forward just after the hour Mc Daid found Luke Mc Givern in acres of space but his shot on goal was scuffed and the chance was gone to make it three. Flint had further opportunities to come back into the game but Cadwallader again and Kyle Smith were to rue poor efforts from promising positions when they did sometimes break through the resolute Hotspur defence. On 80 Flint got the ball in the net but the effort was ruled off side. After this the Flint side were piling on the pressure but Hotspur’s defence was unruffled until in the 4th minute of added time they scored. Carl Jones made a great double block but the ball ran lopopse to Mark Cadwallader who shot home. Still piling on the pressure but Hotspur held out for a famous win.